“Reeds On The River” Song Award! It’s a nice feeling to be near the top of the heap, especially when it concerns our artist’s songwriting and the effort it takes to create and produce the work. The 35th Mid-Atlantic Song Competition just released its results, and “Reeds On The River” is a FINALIST in the Folk Acoustic Category. Nancy Beaudette wrote “Reeds On The River” while on a holiday in Ireland. 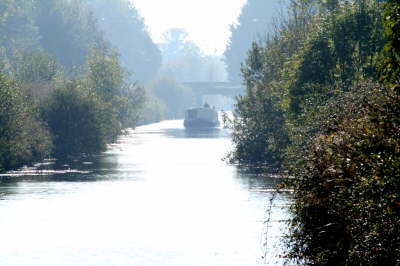 She rented a narrow boat and slowly chugged along the Barrow Line section of the Grand Canal – not too far from Dublin. The boat was 6′ wide and 50′ long, and very heavy, with living quarters below deck. As she floated along the canal, the cattails and lily pads were sucked under the water towards the boat, and danced back above the water line as the boat passed. It was like a beautiful bow of reverence, a consensus that there are things we certainly share, and yet so much more that only time and wisdom can reveal. The Kelly Girls included this song on their CD, “May You Always”, released a year ago. Click here to watch the video.